Homogenous systems can be monitored, however, as a whole, allowing the technician to monitor all points at all times during the process. Monitoring the entire magnetic separation process provides an easy and objective quantification of the separation time parameter. The separation time is the time between when the vessel is placed inside the biomagnetic separator and before the supernatant is pumped out. This is a practical value that should be followed by production technicians and that should be used in any standard operating procedure (SOP). But determining this value in classic, inhomogeneous magnetic separators is not straightforward. The magnetic beads move at different speeds at different points in the vessel. In order to determine an SOP for these inhomogeneous separators, it is necessary to sample the beads at different spatial points and times. This requires a complex and expensive validation experimental design for each individual product in order to have reliable results. 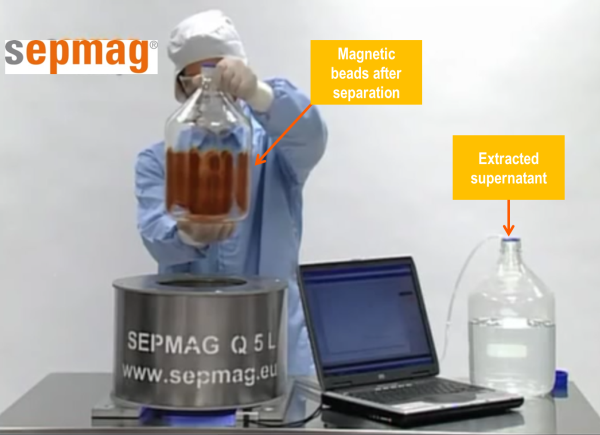 In contrast, homogenous biomagnetic separation conditions such as those provided by SEPMAG technology allow all beads to move at the same speed, since the force is constant over the entire working volume of the vessel. The bead front moves radially and can be easily monitored and quantified. Optical measurement can be accomplished over the entire suspension volume, eliminating the need for complex sampling protocols. Monitoring systems such as the SEPMAG QCR provides a standard separation curve, making it much easier to quantify separation time. Since the curves are typically sigmoidal-like, the half separation time (t50) is the suggested ‘robust’ measurement. A direct measure at 99% separation is possible, but there is more signal noise, decreasing the accuracy of the measurement. In practice, separations times that are 3-5 times greater than the half separation time will give > 99% recovery. If it is necessary for the purposes of validation, traditional sampling can be performed in order to fine tune the separation time. In homogenous biomagnetic separation, because of the constant speed of bead movement and a standard protocol to determine the initial separation time, sampling experiments are straightforward and the size of validation experiments is minimized. Monitoring homogenous biomagnetic separation processes provides a robust way to determine and validate separation times both at small scale development and scaled up production processes.